Long terms Goals? Short term Goals? No goals? Goal setting. What a thing to do! Of course, I teach my students in grade 9 and 10 physical and health education, goal setting is a necessity. Whether it is related to personal physical fitness, personal health, academics, or time management, goal setting is important so you know where you are and you can work towards where you want to be. Goals must be SMART: Specific, Measureable, Attainable, Realistic, and have a Time Frame. As is quite common with my posts, this topic extends from discussions I have had with friends recently. One of my friends is on year 3 of a bet with a co-worker. The bet is: she could stop eating candy longer than he could stop smoking. They are both apparently very disciplined! Another friend has also made a long term of goal of not eating jelly candies for 2015. I figured if these people can do this, then why can’t I? Another friend has expressed doubt about the necessity of long-term goals. I agree…unless I am very passionate about an idea or a goal, I would never do it. I have never been at this point where I have even the consideration of making a long-term goal. But maybe I am “growing up” and getting more disciplined in my “old age”. Also some people don’t need to make such extreme goals because they are already disciplined. I fully support doing what you need to do. You do you! That being said, this year, 2015, I decided to make two fairly major long-term goals. When I say long-term, I mean for ALL of 2015! I have not done this before, mostly because I am not disciplined enough to stick with it. But besides needing discipline, I think it can also be about where you are at…what you are feeling and what you need to do. I feel really confident and passionate about these goals so I am determined. Goal #1: I will not buy any more clothes until 2016 (starting now)! Ok I said it and I posted it so now I have to do it. The only caveat to this is unless it is necessity, which is highly unlikely because I have lots and lots and lots of items of clothing. And this goal is a co-goal with my husband, who has also committed to not buying any more clothing this year. If there is something either one of us needs, we have to have it approved by the other person. The other person can question the need and point out alternatives that are already owned and unless he/she can prove the ultimate need for an item of clothing, he/she cannot buy it. The reason we/I have come to this point of not buying clothing for a year is because this is how I operate: I decide I “need” some particular item that is in fashion. I become determined to find this item. I ‘obsess’ about when I will go to the store or the mall again so I can get that item. Finally I get there and I find it and I buy it. I take it home. I wear it. I am so happy that I got it. It makes me feel so good. I am fashionable. Then what? That’s it. Now I feel a little let down because all that thought, effort, time, and money when into a moment of feeling “good”. Was it worth it? Not really. So although I will still care that my clothes are classy and nice and neat and that I am clean and look nice, I will not spend all that time, effort, and money on momentary feelings. Instead, I hope that I can re-focus that into deeper feelings and interactions. Another part of this goal has to do with others in the world. When I look at my wardrobe and the amount of money that I have spent, I know there are many others in the world that have houses that are worth less than my wardrobe. And to be honest I do most of my shopping at H&M so I am not spending a whole lot! I think back to my trip to Malawi, Africa last summer and to all the wonderful children I met. These children are incredible and yet that have so little. So much less than you or I could ever imagine living with. These children recently went through a devastating natural disaster and so are living with even less than nothing! If you can, please find out more information and help here: http://www.jacarandafoundation.org/content/emergency_relief_help. Goal #2: I will not get a manicure or pedicure in 2015. This may seem like a ridiculous goal but let me explain. Mani/pedis have become a part of my life since I live in countries in the world where they are cheap and easy to get. The reason for this goal extends from some frustration that I have over the quality of the mani/pedis that I get. Despite that they are fairly cheap, I still expect a certain standard of service. Therefore, I will take care of my own nails! And as I result I will be saving a bit of money as well. I understand that this is no cause of acknowledgement or accomplishment. Again there are people in the world who are dealing with much more difficult goals and so I do not expect any accolades. This is just where I am at and what I need to do. What do you think? Are you into long-term goals? Short-term goals? (Short-term goals are also vastly effective and important as well, as seen in my 2 recent posts.) Not making goals? Now that I am not buying my own clothes, I have time to dress up Hamish! Unfortunately, he has an extreme dislike for clothes. 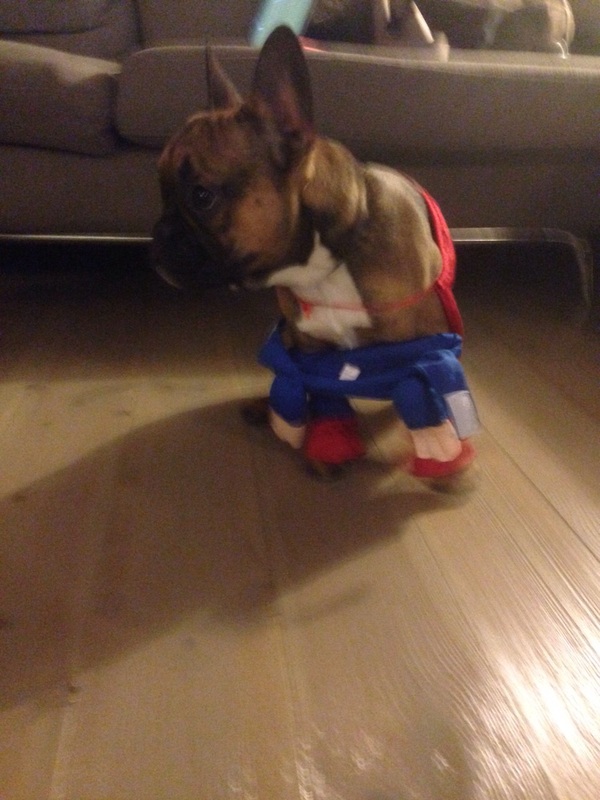 He especially hated having to wear this Superman outfit. I agree with what you’re saying here Shanti, you should have an array of goals. How I see it is, if you don’t have “cream big” kinds of goals, then the problem is, you will not take the massive action needed to attain those goals. Mediocre and attainable goals create mediocre motivation and even more mediocre, non-purposeful action. Great article and great points. We should connect! Come check me out by searching “Toronto life coach ” on Google. Keep up the inspiring work!